If you’ve read this blog before or seen my JMP blogs, then you know that I’ve been looking recently at my historical strength training data. I’ve been trying to come up with different ways to visualize all the data I’ve collected over the years, which you can read more about on past posts on this blog or here on the JMP blog in my Fitness and Food series. I’ve been visualizing metrics like max weight lifted by exercise, as well as total weight lifted summarized at various levels as a function of weight used, number of reps and sets. Below is one example of a graph of total weight lifted by body zone (upper/lower) that summarizes the total weight I lifted across all workout I currently have in my JMP workout table. I also created a custom body map to help visualize my data, which I am posting about in a JMP blog today. I’ll add a link to that later, but you should be able to visit jmp.com/blog to see that post if I don’t get to adding the link right away. My Fridays are pretty busy and the SAS Spring Picnic is this evening, so I’ll be looking to finish up the update I write for our R&D division every Friday and get to the picnic with my family! Here is one example of how I used the custom map as a selection filter to drill into total weight lifted by primary body part. As I mentioned here in an earlier post, I recently replaced my BodyMedia armband in advance of the summer to avoid upper arm tan lines, adopting a Fitbit Charge HR. I’ve had it about 45 days and I love it! I’m still expecting a tan line on my wrist, but somehow that’s easier on my vanity than strap tan across my bicep/deltoid area…vain, I know, but my desire to avoid that upper arm tan line has impacted my data collection during the summer months (as you can see on the JMP blog here) so I’m aiming to avoid that and collect better data this summer. While I adore the FitBit for monitoring my sleep, workouts, steps and calorie burn, it doesn’t measure anything unique when tracking my weight workouts vs. tracking a walk or bike ride, so there is room for another device in my life. As part of my ongoing effort to learn more from my training data, I’ve recently started investigating various wearable devices for weight training. This week I listened to several podcasts and watched videos and reviews of strength training wearables aimed at helping improve performance in the gym. 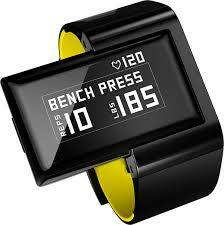 The three devices I looked at were the Atlas smart watch, the Beast from Beast Technologies, and the Push Strength band. They all can count sets and reps and track various metrics about workouts like power and velocity of lifts. While I’ve certainly varied the speed of my lifts before, I haven’t thought in depth about collecting any of these metrics to assess my performance. Until recently, you really needed lab-quality machinery to do so, but fortunately, that’s no longer the case! While the Atlas watchband looked pretty cool, I wasn’t sure how comfortable it would be due to the rectangular wrist unit, and I didn’t really need the integrated heart rate monitoring it offered since the Charge HR already does that for me. The deciding factor turned out to be that it was only available for pre-order at the time I was looking. However, I was excited to see that they did have a custom body map in their app for tracking which body parts were hit by different exercises! This is definitely a device I will keep an eye on for the future. I like that it can automatically learn about new exercises and recognize their profiles for use in future workouts. It’s also water resistant and can offer critique on your exercise form. 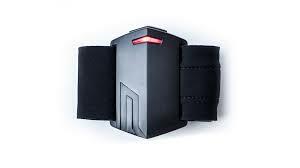 The Beast unit is magnetic, and so can be attached to a weight stack, barbell, dumbbell, or wristband. The unit seemed pretty thick to wear on a band, though, and I could not get over my fear of leaving it behind at the gym or trying to remember to stick it in the right place when doing different exercises. I tend to do a lot of supersets in the gym, moving quickly from exercise to exercise without a lot of rest in between, so I didn’t want to have to do that much adjustment between sets. I also didn’t want to have to limit my use of the device to home for fear of losing it-though keeping it at home still wouldn’t guarantee against loss, potential laundering, or being carried off by one of my kids…In the end I decided against it because I prefer my activity trackers to be as passive as possible. Even remembering to set the workout timer on my Fitbit Charge HR is a challenge for me, and I specifically chose that monitor over other devices because it auto-detects sleep rather than requiring me to put it into sleep tracking mode. I just wanted something I could put on and go. As you can imagine, given my hatred of the strap tan thing, I was initially a bit distressed to hear that the Push Strength device was also on an armband. The Push band is worn on the forearm and not the upper arm, though, and I only anticipate wearing it during my workouts all done inside, not 24-7 like I would wear an activity monitor like the BodyMedia FIT or Charge HR, so tan lines will likely not be an issue. The fact that the device looked so much like a Cylon helped. 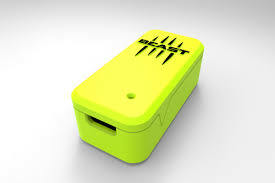 But the kicker was really when I saw several fitness professionals/professors I respect note in a Facebook conversation that they were impressed with the device-this definitely helped me get over my initial hesitation. It’s being used widely by college and pro sports teams as well. Push Strength advertises an API for data export. I’ll be investigating that and will definitely post on the data I collect in the near future!